one of the company's many locations. Mega-retailer Walmart today announced it's beginning testing of Walmart To Go, a service that lets you pick up pre-ordered groceries without having to even leave your car. The retail giant’s new service works similarly to those currently in place at a number of high-end grocery stores. You place your grocery order online via a special Walmart To Go website. Then, at your convenience, you can swing by your local Walmart store, where your groceries will be waiting to be loaded into your car. Better yet, if the store has a drive-thru pharmacy, you can pick up your groceries right at the window. You’ll need to flash your ID and the credit card you used to make the purchase to pick up your groceries. There’s no extra charge for using the Walmart To Go program. The new service is intended to be an add-on to Walmart’s same-day grocery home-delivery option that's been in testing in select markets. It’s thought that a pick-up service will encourage shoppers to grab even more items than what they already bought online. The option will also help differentiate Walmart To Go from Amazon's same-day Local Express Delivery service. A lot of us pick up fast food after a long day because using a drive-thru is easy and convenient. Hopefully, Walmart’s new service will encourage us to eat healthier by making it just as easy to pick up fresh groceries, vegetables, and the occasional pre-cooked rotisserie chicken. Walmart’s new Walmart To Go service is being launched as a test in 11 Denver-area stores, though you can expect the program to spread quickly if it proves successful. 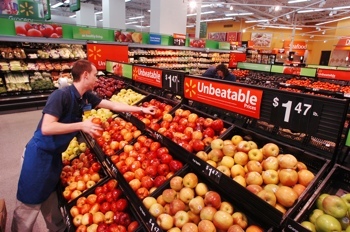 To learn more about Walmart To Go or to place an order, visit the program’s website at delivery.walmart.com.